Marlborough, South Island, New ZealandWhen this was picked, it was the only fruit remaining in all of Marlborough. In 2015, it took until 8 June until all the fruit would accept the botrytis. The shrivelled grapes were whole bunch pressed, cold-settled, and then racked to old barrels for partial native fermentation. The fermentation was eventually stopped in September, retaining 105 g/l residual sugar. The wine then aged in barrel for a further nine months before bottling. Lovely honeycomb, butterscotch, and caramel, with a fine kiss of smoke wrapping around a pear nectar core. There's a spire of acidity and lovely fresh spicing that carries this savoury sweet to the finish. 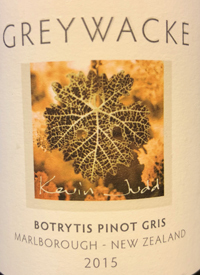 Not made every year.Tasted: 26 October 2018Tasted by: Treve RingPrices: BC	43.00	375	private wine shops Producer: GreywackeDistributors: Pacific Wine & Spirits Inc.